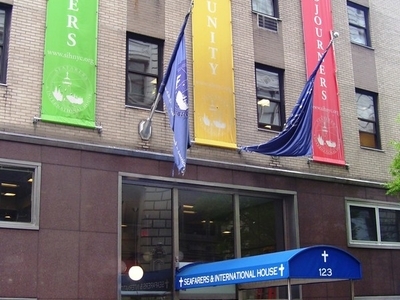 Christ Church Lutheran is an Evangelical Lutheran Church in America church located near Union Square in Manhattan, New York City at 123 East 15th Street at Irving Place, in the Seafarer and International House. The congregation was founded as the Evangelical Lutheran Church of Christ in 1868, and has had four premises in its history. The Evangelical Lutheran Church of Christ congregation was founded in 1868 above a blacksmith shop on East14th Street. The congregation was of German and English descent. A more permanent presence was established in 1882 when the church purchased the former mission chapel, the Chapel of Free Grace, located at 406 East 19th Street, which had been built in 1859 by St. George's Episcopal Church. It was a gable-fronted steeply pitched masonry Gothic Revival church with a gable rose window. Here's the our members favorite photos of "Churches near Manhattan". Upload your photo of Christ Church Lutheran!